I love Deutz Champagnes, and fortunately got a great deal and once stocked up on Magnums of 1990 Cuvee William Deutz and 1993 Blanc de blancs, unfortunately now almost gone. 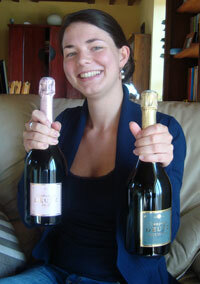 Their entire range of Champagnes are great, and they have a firm and light to medium+ bodied style. Deutz is based in Aÿ, and until 1993 were a family owned house. Now the Louis Roederer Champagne house owns a majority stake, and quality has not suffered at all! Surprisingly they are not as well known in the USA (which is why I was able to get some killer deals in the past, for example mags of the 1990 Cuvee William Deutz for an unbelievable US$90), but are widely respected and available in France. There wines include impressive two impressive and powerful NVs, a Deutz Brut Classic and Deutz Rose, as well as their vintage counterparts, labeled Millésimé. Their long lived and classic Blanc de blancs is always a vintage wine, and they make three prestige cuvees, all worth seeking out, Amour de Deutz Blanc de blancs, Cuvee William Deutz and Cuvee William Deutz Rose. A light yellow color with perhaps a touch of orange around the edges, or maybe my mind is playing tricks. On the nose, lightly toasted bread, creamy, and smooth with a slightly maritime characteristic, perhaps of periwinkles. No else else sensed this, but it was clear to me. The taste was firm and lemony with plenty of backbone and good acidity and creamy. A pretty big and robust NV. I am impressed by it yet again! Palate coating yet elegant and very long. Creamy. You can certainly taste the Pinot Noir in this. Lychees as it warms. Nose - creamy, maybe a hint of rhubarb, subtle, touch of distant citrus. This is a BIG step above Deutz’s regular Blanc De Blanc, which is also superb! My notes read "AWESOME - 95 points"
Deutz also makes sparkling wines from grapes grown in Marlborough, New Zealand and I may review them some day later. I must admit, despite having spent the better part of a year total over many trips to New Zealand, and loving New Zealand whites, their sparklers have not impressed me. I have yet to try Deutz's though, and will keep an open mind.